One of the most interesting and underground artists in Melbourne is Jason Maling. His three year project The Vorticist is so secretive that you need to be part of the experience to understand it fully. Lala invited Katerina Kokkinos-Kennedy to interview Jason Maling, a Melbourne based live artist currently presenting The Vorticist, a three-year durational appointment-based project at the Abbotsford Convent. Katerina: I know that you are a visual artist, an object maker, and a performance – maker. Can you tell me a little about how your practice has evolved? Jason: I trained as a painter and became interested in the rituals that surround the production of images. Things turned very quickly into process work. That’s how I got into performance making, by creating rules. After putting myself through these situations for some time it evolved into not only showing the outcome but also the process, as a performance. I then started asking other people to do it and removing myself altogether. The rule structures became more elaborate and two fold. It was theatrical in the sense that the process had an audience and the work was presenting a certain narrative, but it was internally written, the experience was constructed for the people engaged within the system of rules. I was interested in creating experiences where you as a player could go through something and indirectly present something else. Katerina: So from what I understand, you began by making these rules for yourself as an artist. So what was the shift that made you want to start putting other people through your paces? Jason: I became a variable in the system and I was curious about what other variables would produce. It was always based around objects structuring the action, and images or text being an outcome. I would cut and reuse fragments of stories and reorganise them with simple devices like musical chairs. These resulting elements might cause something else to be thrown, spoken or drawn. I always come back to drawing and this is where the problem is with talking about it as one thing or another, it really is just composition, I use what ever is necessary within the bounds of the questions being asked by the work. It might be an image, object, text or movement, or a tension created through some combination. I construct projects as drawings. I visualise how people operate within systems, a type of fluid composition. I think of these compositions as networks of phase spaces and brackets, which are negotiated by choices made internally. Although there is also the consideration of how that system is perceived exteriorly. Katerina: Are you saying that you became more interested in how other people would approach a task that you had set? Jason: Yes, more interested. I find myself rather dull. It has become increasingly the case that I am not interested in making content, in coming up with meaning that is generated by me, it is about finding a structure which causes it to emerge in relation to a variety of elements. Katerina: What you describe is similar to Anne Bogart’s compositional work. Her actors are given a structure, a list of elements and from that list they have to make a work. Sometimes they are given half an hour or three days. She understands that duress can produce startling results. She borrowed this concept from a choreographer but it is a kind of structured playground concept like the one you speak of. Jason: Absolutely. For a long time I have explored, (and this is how The Vorticist project evolved) the idea of the tool. In terms of an object both metaphorically and physically, you can’t fake a tool, it is built to do something and its live application is its test. You can go out and test your tool to see if it works and if it breaks or causes something unforseen to happen you go back to refining it. The relationship between the studio-process, the composition or structuring process is considered very much around the notion of a tool. Quite literally some of the projects have been sets of tools. One project, Splint, specifically evolved from the question, what would happen if you equip a group of people with a boundary-defining tool? If you give people a tool that through its use implies multiple frameworks of play, you don’t need to have rules. You are providing a type of hardware that generates the software. Katerina: What are the rules for The Vorticist? Katerina: A kind of contract? Katerina: It’s alchemical too isn’t it, because everybody brings something and between the two of you, you have to negotiate the meaning. Jason: Yes it’s grown quite organically from what began as a very simple studio invitation based on how people responded to the tools. The question that kept coming up was how could I create a set of spaces that someone could pass through, in a similar way to the experience of going to the theatre or a gallery. We often already know the title of the show, the artist, the type of space and whether or not it is art. We have boxed the experience three or four times before we get there. We are very ready for it but in a prescribed way. Katerina: We might also be obliged to like it. Jason: Absolutely. So one of the questions in The Vorticist project is how can you create a series of gateways to try not to let people do that. To try awfully hard to suggest to them that they let it go. Don’t try to find out before acting. With The Vorticist, someone may get a recommendation from a friend who says nothing and then go to a website with a set of suggestively meaningless questions. This is probably the only information they will have before making an appointment. In the same way that in going to the theatre we have possibly gained something before getting there, in this case I am trying to create a process by which we lose something. You have emptied yourself. Hopefully. So that when you enter the Vorticist’s office it’s a bit like “I don’t know why you’re here – you don’t know why you’re here – ok, lets see what happens”. Katerina: You do realise it’s become a secret society don’t you? 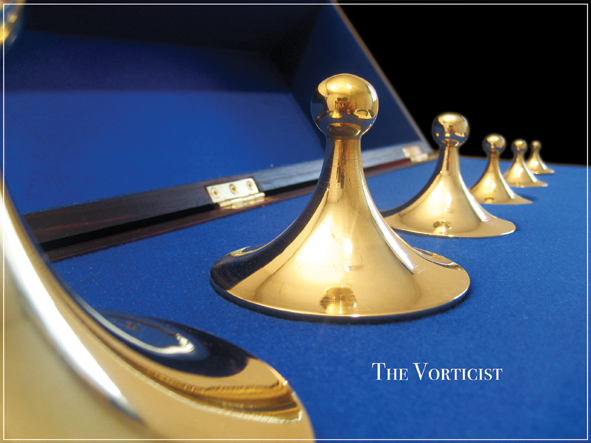 I know a few people who have been to The Vorticist and we’ve never talked about the content of our experiences. Jason: Even though the notes are public? Katerina: Yes, but they are anonymous. People want to maintain something about their individual experience, the particularity of it. Friends will say, ‘I went – Thankyou,’ and then there’s this knowing look. Jason: Yeah it seems to function like that. I am a huge fan of those objects or mysteries that exist in history like for example the Voynich manuscript. They seem to have a scale to them. You can sit on the side of a belief where the thing represents something specific and meaningful and clearly understood. Or it can be completely playful, ridiculous, poetic. The nature of the thing allows both points on the scale and we can move between them. It intrigues me that The Vorticist for some people is a very defined type of experience and for others it was an experience to play within.